Scissors - tools for cutting sheet materials or yarns, but hopefully not people! In many industrial processes, it is vital that the scissor in your hand cuts the moving yarn or fibre bundle precisely, completely and at the first attempt. There is no room for error, because the cut is being made to feed a machine or to doff the yarn - any partly severed material will lead to a shutdown situation or even to an accident. Nylon and polyester fibres, as well as the more delicate acetate yarns, are all cut excellently well by this popular German-made scissor - branded the "Finny". Finny is made in several sizes, but the one we like the best is the 5" size - fits nicely into the pocket, and is extremely durable. 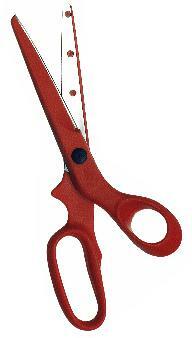 We offer this scissor both with and without Safety Tips, or with pointed tips to special order. Question:- Who made the scissor that won the design award for the best new product in Solingen some years ago? Answer:- A privately-owned company called Peiniger GmbH, whose "FeatherLIGht" design spawned a range of scissors under the "Flig" brand. We are importers and distributors of these scissors for the UK, and carry the 23cm general purpose scissor (pictured) in stock. For more information about Flig scissors, click the link.